As one of our most popular expeditions, the Lemosho trek remains to be the ultimate way to experience on Kilimanjaro. 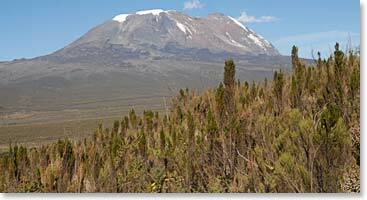 This unique trek will have our team exploring the unspoiled Shira Plateau, climbing the unforgettable Lava Tower and sleeping in the actual crater of Kilimanjaro at 18,700 feet. This trek gives the climber a first hand view of all the distinctive aspects of Africa’s greatest mountain. From the alpine desert all the way to the giant glaciers inside the crater. Join us as we send day to day dispatches from this treasured adventure. February 2, 2009 – Dwight and Richard Reach the Summit! February 1, 2009 – Summit Is Not Too Far Away Now!